As the fight against H.I.V./AIDS goes beyond the quarter century mark, the issue of stable funding is now center stage. In the coming decade, between $15 and $22 billion a year will be needed to fight AIDS worldwide, according to UNAIDS, the United Nations agency. Only 50 percent of expected funds for AIDS relief were available in 2005 and 2006. Besides the role of bilateral and multilateral agencies in funding AIDS programs, philanthropic organizations and foundations are now expected to help close some of the funding gaps. In this article, I discuss the need for private, nongovernment philanthropic organizations to realign their funding priorities in the fight against AIDS. According to UNAIDS, the Center for Global Development in Washington, D.C., and a review by both Progressive Health Partners, a public health consulting firm in Washington, D.C., and the AIDS Research Institute of the University of California at San Francisco, it is often difficult to precisely track the financial impact of philanthropic organizations and foundations in the fight against AIDS. It is difficult to track spending because donors in international development are not known for their agility in disclosing funding data; because donors and recipients often operate different budget cycles; because donors usually provide data on funding support at the end of each program year; because donor grant awards are normally multi-year and may be disbursed based only on the preceding year's performance; because grant awards may support other health programs besides AIDS relief; because significant lag time may exist between donor awards, disbursement of funds and implementation of programs in target communities; and because of the inability of current program monitoring protocols to track multiple program activities. H.I.V./AIDS programs in the last decade have benefited from the support of major philanthropies based in the United States and Europe. These foundations include the Gates Foundation, the Rockefeller Foundation, and the Ford Foundation, and the Wellcome Trust in Britain. The Clinton Foundation has emerged in the last few years as a broker and facilitator of worldwide efforts to reduce the cost of antiretroviral therapy and other medical goods in poor countries. UNAIDS estimates that private foundations and philanthropies will spend about $400 in 2007 in the fight against AIDS out of $10 billion projected worldwide expenditure. 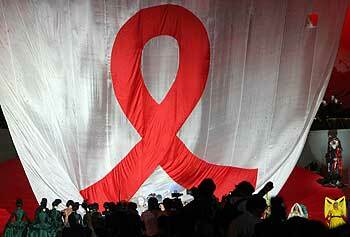 UNAIDS estimates that philanthropic organizations spent $400 million fighting AIDS in 2005 as well as in 2006. The optimal funding level for AIDS relief in 2007, according to UNAIDS, should be at least $18 billion. International philanthropic financial support for AIDS relief has a long way to go to close funding gaps. However, it is important to note that annual spending estimates for international philanthropy may not take into account the cost of multi-year awards and technical assistance programs. A major contribution of philanthropic organizations to the fight against AIDS has been the capacity to deploy significant resources as quickly as possible. This scenario is allowing researchers to focus on their work. The dramatic support for H.I.V. vaccine research by the Gates Foundation is a case in point. In 2006, the Gates Foundation announced 16 grants totaling $287 million to 165 investigators from 19 countries jointly to tackle scientific hurdles to effective H.I.V. vaccine. The Wellcome Trust is investing heavily on strengthening research capacity in poor countries through dedicated training programs, health infrastructure development, and mentoring support for young scientists. By marshaling significant funds and deploying them as quickly as possible, philanthropic organizations made another important contribution to AIDS relief efforts: the creation of dedicated global public/private/civil society alliances to tackle specific diseases and health conditions. Philanthropic organizations are indispensable financing partners in ongoing global alliances against malaria, tuberculosis, and neglected tropical diseases. How can philanthropic organizations realign their funding priorities in the fight against H.I.V./AIDS? Philanthropic organizations should realign their funding priorities according to five priority areas. First, international philanthropic organizations need to become significant players in closing funding gaps in AIDS relief in low- and middle-income countries. According to the Center for Global Health Development, three entities account for more than 50 percent of the global expenditure on AIDS relief. These entities are the Global Fund to Fight AIDS, Tuberculosis, and Malaria, the Bush administration's President's Emergency Plan for AIDS Relief (PEPFAR) program, and the World Bank's Multi-Country H.I.V./AIDS Program for Africa (MAP). One-third of spending on AIDS is borne by domestic public and private, mostly out-of-pocket sources in low and middle income countries, according to UNAIDS. Domestic spending is not expected to rise significantly in poor countries in the coming decade. Philanthropic organizations should work closely with bilateral and multilateral organizations and businesses to meet AIDS resource requirements in poor countries. UNAIDS estimates that in 2008, H.I.V. prevention programs will cost $11.4 billion; AIDS treatment and care, $5.3 billion; AIDS orphans and vulnerable children care, $2.7 billion; H.I.V./AIDS program costs, $1.8 billion; and human resources costs, $1.9 billion. International philanthropies may work with other partners to close funding gaps in each of the aforementioned program areas. Second, international philanthropic organizations should adopt a geographical approach to AIDS relief to ensure that funded programs meet the felt needs of target populations. With the scarcity of resources to fight AIDS, it is critical that the real needs of target populations become the focus of relief operations. Foundations and philanthropies should implement a geographical strategy for funding support to ensure maximum focus on the health and non-health issues that propagate the global epidemic. A geographical focus will allow foundations to pay close attention to the risk factors of H.I.V. transmission, the triggers of clinical progression to AIDS, and the non-health drivers of the epidemic. These non-health drivers include poverty, dysfunctional health systems, harmful cultural practices, gender inequity issues, political instability, and conflicts. For example, a foundation may choose to focus on sub-Sahara Africa, on Latin America, on the Caribbean, on Southeast Asia, or on the former states under the Soviet Union and make grants that address the unique risk factors and social drivers of H.I.V. transmission. Large foundations with enough resources may chose to devote program resources to all regions at the same time, with experts focusing on each particular region. In each geographical region, foundations may also choose to focus on subregions or aggregations of countries that share similar cultural and linguistic characteristics to maximize the impact of their resources. By way of illustration, a focus on the Southern Africa region, which represents only 2 percent of the global population but accounts for 30 percent of individuals living with H.I.V./AIDS worldwide, will likely include program support for long distance truck drivers, miners and the families they left behind to work in distant mines, high H.I.V. prevalence rates, AIDS orphans and vulnerable street children, and collaboration with the businesses that dominate the economy of the subregion. A geographical approach to AIDS relief will also force foundations and philanthropies to confront issues that have never been their strong suit. These issues include the need for foundations to collaborate with each other and coordinate program support in the same geographical areas, the possible need to focus on areas of comparative advantage and expertise, the need to address broken health infrastructure at community levels, the need to revamp dysfunctional health systems, and the imperative to address social drivers of H.I.V. transmission such as poverty and gender inequities. Third, international philanthropic organizations should devote significant resources to achieve universal access to H.I.V./AIDS, TB, and malaria services in poor countries. The universal access initiative has the potential to transform health systems in poor countries as they address three leading causes of morbidity and mortality. In some poor countries, a dedicated attention to the three health conditions can have significant transformative impact on health systems. Malaria in endemic countries accounts for 40 percent of public health expenditure, 30-50 percent of inpatient cost of care, and 60 percent of outpatient visits, according to the World Health Organization. Regions with endemic rates of H.I.V./AIDS, TB, and malaria are already moving forward with plans to achieve universal access. The key is for foundations and philanthropies to work closely with host governments, bilateral and multilateral agencies, the organized private sector, and civil society to tackle obstacles to achieving universal access. Fourth, international philanthropic organizations should pay close attention to expected program outcomes. Donor organizations must tighten the process for achieving expected program outcomes so that successful ones can be scaled up to serve more individuals and communities. International philanthropic organizations should invest more resources on monitoring and evaluation protocols, using highly respected local experts. They should devise creative ways to keep abreast of ongoing programs in target communities and to assist grantees in doing a better job of meeting expected program outcomes. Finally, international philanthropic organizations should significantly increase their support for H.I.V./AIDS, TB, and malaria research. The focus should be on creating sustainable research capacities in poor countries and encouraging vibrant research networks throughout specific geographic regions or countries. During the last few years, foundations and philanthropic organizations have financed dedicated international alliances focused on the containment or eradication of specific diseases. The next step is to create a strong network of indigenous researchers and scientists who will become the backbone of disease containment efforts in their countries and regions. International philanthropic organizations are critical in worldwide AIDS relief efforts. They can mobilize significant resources at short notice. They can also energize AIDS relief efforts by bringing together individuals and organizations to share expertise and jointly tackle obstacles. As the response to the global AIDS epidemic evolves from an emergency strategy to that of long-term relief, international philanthropic organizations have an indispensable role to play in ensuring that enough resources are available for AIDS relief.